This little blog started out as a way for me to escape some of the craziness of my life and reach electronically out into the world. Not that I don't love the crazy in my life - I do! But, teaching in a Title I school with all its special challenges is demanding enough - now throw in 3 boys, a husband, an itty bitty house, and a cat. Mix in a dose of ADHD, Asperger's, a whole bunch of middle school homework, a couple of toddler tantrums, and a broken toilet. Now that is nothin' but fabulous! Life comes at ya fast, baby - duck or catch! (I also feel I must mention that the last boy is 3 years old and I am 46 years old - yes, do the math. But, since I am still fairly new at this and I have much to learn, when I saw Melissa's post on her blog First Grade Smiles about blogging etiquette and followers' expectations, I decided to jump in. Why do you choose to follow a certain blog? 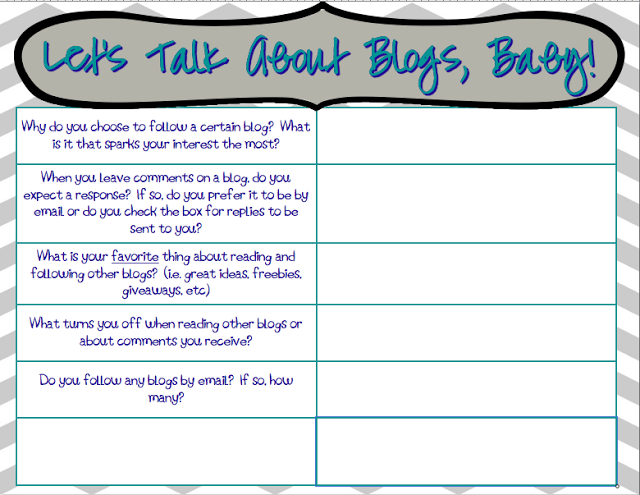 I usually am drawn to blogs that have ideas I can put to use in my own classroom. I like pictures! I want to see the pic so I can stick it quickly in my brain (or better yet, Pin it!) I like a little wit and humor, too, but I really am looking for new insight and ideas. I usually follow blogs that follow me - I figure if they found something on my blog that made them want to follow me, maybe we have something in common and I can find insight on their blog. When you leave comments, do you expect a response? I do not really EXPECT a response, although it is nice. Sometimes I will check back for a response, and sometimes I will subscribe to the comments so I can either see a response or see what others have to say. reading and following other blogs? other blogs or comments you receive? I really am interested to hear anything anyone has to say when they comment on one of my posts! I'm flattered that anyone took the time to comment. That said, I don't like it when folks only comment in order to ask me to follow them. But, I do love for other bloggers to leave a link to their blog when they comment! 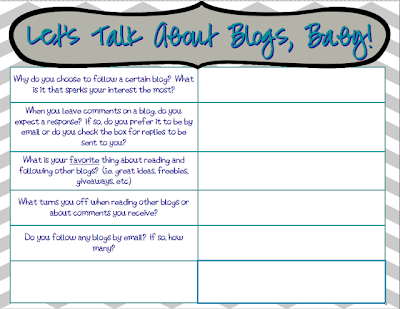 Do you follow any blogs by e-mail? Only a few and only when I cannot follow through the blogger feed. I really rely on Facebook to alert me to new posts. Do you use Facebook, Pinterest, Twitter, TpT, etc.? I use Facebook and Pinterest quite a lot and I love to follow others. 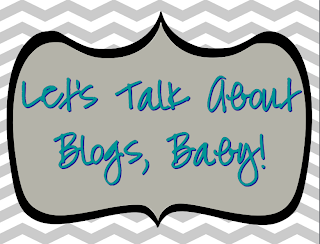 I like to see the links for those pages right at the top of a blog so I can quickly link up. Thanks, Melissa for a great linky idea! Hi Nikki! Thanks so much for linking up :) You sure do have a lot on your plate, but I'm sure those smiling faces you see when you get home make it all worth it!!! I loved your responses - very thorough! I wasn't sure if the question form would be enough room so I'm happy to see you just answered below so you could fit in all you wanted to say. I agree that I don't love the comment verification. Sometimes I can't even figure out what the letters are :) It's so interesting to know that you rely on Facebook to alert you of new posts. I have a Facebook page but haven't been linking my posts to it directly. Maybe I should start doing that. Although, I don't have as many followers on there. Definitely something to think about. Love your blog and happy to have found you! Thanks so much for hosting the linky! I think I didn't have enough room to put the answers in the form because my blog has three columns, making the middle column rather small:( But I'm kind of wordy so I still would've needed more space! Someone else hates the verification!!! Sometimes I think the only one that can read this is a computer! You and I have a lot of similarities! We could swap war stories about three boys. War stories - yep! It does feel like Lord of the Flies around here sometimes! I like using Facebook, Pinterest, and TpT as well. I just recently started using Twitter. I am still not sure what I think of it. I agree about having Facebook links at the top of the page. I don't want to have to search through the blog for the link. I think I would lose all contact with the world without FB! I haven't tried Twitter, yet. Not sure if I can manage one more thing!